Apple Pay is experiencing “phenomenal traction”, with transaction volume up 450% over the last 12 months, Apple CEO Tim Cook has revealed. Monthly Apple Pay transactions have grown by nearly 300% in the last year across the UK, while in Japan more than half a million transit users are completing 20m Apple Pay transactions per month. “Apple Pay is experiencing phenomenal traction,” Cook told investors during Apple’s second quarter 2017 results. “With the launch of Taiwan and Ireland in the March quarter, Apple Pay is now live in 15 markets with more than 20m contactless-ready locations, including more than 4.5m locations accepting Apple Pay in the US alone. Apple Watch sales nearly doubled year over year, Cook also revealed, with the active installed base of iPhones growing by double digits over the same period. 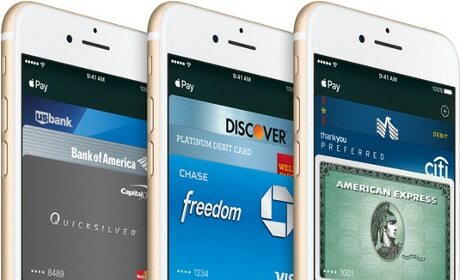 Apple is reportedly working towards launching a peer-to-peer (P2P) payment service later this year, as well as rolling out its own prepaid cards that would tie to the P2P service. Some 3.4bn smartphones are expected to be compatible with Apple Pay, Samsung Pay and Android Pay by the end of this year — with that number expected to increase to 5.3bn by 2021. Android Pay set for launch in Russia this month? This probably does not surprise many Apple Pay users but should surprise all those who made predictions about it at the time of Apple Pay’s announcement. This is not simply a measure of the preference for mobile payments but represents a reduction in risk in retail payments. Every Apple, Android, or Samsung Pay transaction is one less use of a broken magnetic stripe card. In the Apple earnings call, Tim Cook reported that there are now 4M merchant locations accepting contactless payments in the US, up from 200K at announcement time, 20M world wide. The rest of the world was already implementing contactless before Apple Pay for use with contactless EMV cards. The driver for contactless in the US is the disastrous rollout of (contact only) EMV, which is too slow for so many applications.